Click the Google Map on the left to view a larger map or for directions to Design Center Philadelphia. Click the Map on the right for a printable PDF. Follow I-95 south to Exit 22 (Central Philadelphia). At the end of the ramp, turn right onto Callowhill Street. Continue on Callowhill Street to 12th Street. Turn left onto 12th Street. Turn left onto 11th Street and continue to 1100 Ludlow Street on your left between Market and Chestnut Streets. Mom’s Organic Market is on the ground floor of the building. Take Exit 326 (old exit 24) (Valley Forge) from Pennsylvania Turnpike. Take Rt. 76 East and follow signs for Exit 344 (Central Phila/676 East). Take Exit 344 to Vine Street and follow Vine Street to 12th Street. Turn right onto 12th Street and continue to Chestnut Street. Take Route 309 South to the end of the expressway. Turn right onto Rt. 611 South (Broad Street). Continue on Broad Street (approximately six miles) to Vine Street. Turn left onto Vine Street and follow to 12th Street. Take Rt. I-95 North to Exit 22 (Central Philadelphia). From the exit, stay in the left lanes and follow signs to Callowhill Street. Once on Callowhill Street, stay in the middle lane and continue to 12th Street. Turn left onto 12th Street and continue to Chestnut Street. Take Rt. 476 North to 76 East and follow signs for Exit 344 (Central Phila/676 East). Cross the Walt Whitman Bridge. After the toll booth, take I-95 North to Exit 22 (Central Philadelphia). Once on Callowhill Street, stay in the middle lanes and continue to 12th Street. Cross the Ben Franklin Bridge. After the toll booth, stay in the middle lane directing you to 8th Street. Turn left onto 8th Street to Arch Street. Turn right onto Arch Street to 12th Street. Take Exit 4 (Rt. 73 North) from the New Jersey Turnpike. Follow Rt. 73 North to Rt. 38 West. Continue on Rt. 38 West (follow signs for the Ben Franklin Bridge) to the Admiral Wilson Boulevard and the bridge. Take the westbound Market-Frankford elevated to 11th and Market Streets. Walk south on 11th Street to 1100 Ludlow Street. Mom’s Organic Market is on the ground floor of the building. Take the Broad Street subway to Broad and Locust Streets. Walk east on Locust Street three blocks to 11th Street. Walk north on 11th Street to 1100 Ludlow Street on your left between Market and Chestnut Streets. Mom’s Organic Market is on the ground floor of the building. Take the eastbound Market-Frankford elevated to 11th and Market Streets. Walk south on 11th Street one and one-half blocks to 1100 Ludlow Street on your left between Market and Chestnut Streets. Mom’s Organic Market is on the ground floor of the building. Take R1 from the airport to Center City. Please check with SEPTA for the latest fares. Call SEPTA at (215) 580-7800 for schedule. Take the train to the Jefferson Station at 11th and Market Streets. Call SEPTA at (215) 580-7800 to determine the regional rail line closest to your home. 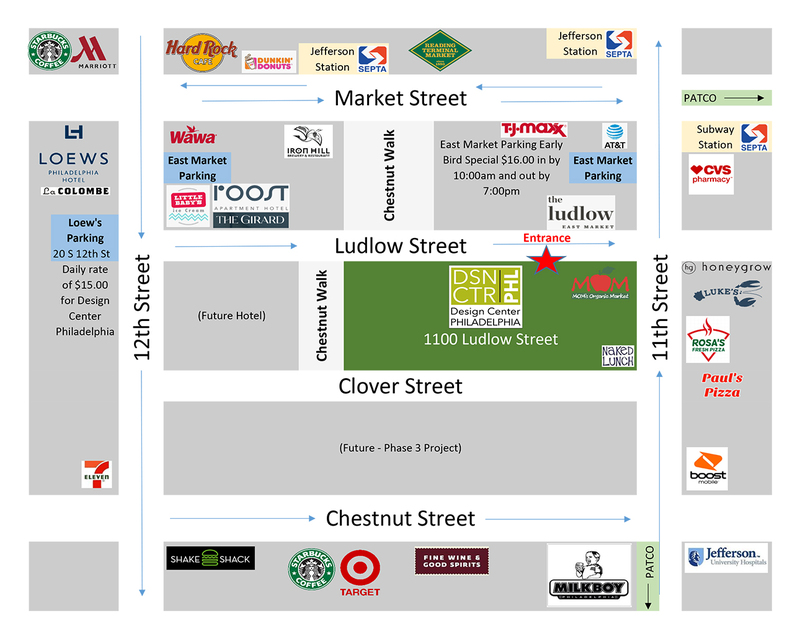 Walk south on 11th Street and one-half blocks to 1100 Ludlow Street on your left between Market and Chestnut Streets. Mom’s Organic Market is on the ground floor of the building. Take the PATCO High Speed Line to the 12-13th and Locust Station. Walk east on Locust Street to 11th Street. Discounted valet parking is available in the Loew’s Hotel Parking Garage. The rate is $15 per day for Design Center Philadelphia visitors. – Parking garage entrance is on 12th Street between Market and Chestnut Streets. – From Market Street, go right on 12th Street. The garage is on the right. Design Center Philadelphia is the premier resource for the interior design trade in Pennsylvania, New Jersey and Delaware. Showrooms offer professionals access to some of the world’s most prestigious brands. Get on the A List!